On Monday 11th December 2017, the Conservative Monday Club held its Christmas Dinner in the Canadian Room of the East India Club, St James’s Square, London. Members and their guests were welcomed by the Club Chairman, Andrew Grocock, and special greetings were offered to those members who had travelled across the sea from Northern Ireland to be at the dinner. After a splendid meal, enjoyed by all, the Chairman welcomed the guest speaker, also from Northern Ireland; the Rt Hon Sir Jeffrey Donaldson MP of the Democratic Unionist Party. 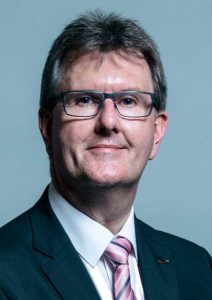 Sir Jeffrey is the DUP Member of Parliament for Lagan Valley, Lisburn and, in the 2017 General Election, retained this seat with a majority of 19,229 (or 42.7% of the vote). He is the DUP spokesman on Defence and Energy policy and has a seat on the Defence Select Committee in the House of Commons. 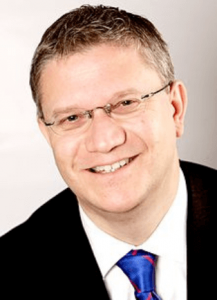 He is also the Party’s spokesman on victim’s issues and, since 2010, a member of the UK delegation to the Council of Europe Parliamentary Assembly, where he sits on the Social Affairs and Political Affairs Committee. The Chairman reminded Sir Jeffrey of the very strong relationship between the Conservative Monday Club and the DUP in Northern Ireland. He recalled the times when the Club had been privileged to be addressed by the late Revd Dr Ian Paisley and that this bond had continued with Ian Paisley Junior and through other members of the DUP. He further added that it had been a great pleasure for him, and other members of the Club, to visit the DUP in Northern Ireland on numerous occasions and that they greatly appreciated the kindness and hospitality that had been afforded them. Sir Jeffrey thanked the Chairman and also expressed his warm wishes to all members of the Conservative Monday Club. During his address, Sir Jeffrey recalled his early days in politics; particularly when he had the privilege of working for the late Enoch Powell. This experience had taught him a great deal and he said that he was forever grateful for that opportunity. He warned of the rise of nationalism which would be the first step towards the breakup of the United Kingdom. He stressed that a free, independent Great Britain and Northern Ireland would present a better future for the next generation rather than remaining in the European Union. Sir Jeffrey believed that additional trade with countries outside the Eurozone was the way forward and he had already had meetings with overseas diplomats to this end. He believed that, eventually, smaller countries within the present EU would be put under pressure to become members of some Federal European Super-state. He felt that the Prime Minister, Theresa May, has Great Britain and Northern Ireland at heart but that she should not give in to unrealistic demands from the EU regarding this country’s exit from Europe. He believed that the UK should leave with no deal rather than made to accept the totally unsatisfactory terms as dictated by the EU. He stated that the DUP was not just concerned with the future of Northern Ireland but with the whole of the United Kingdom. He considered it to be providential following the last General Election and following the pressures on the British Government from Europe, as was seen when the DUP had to object to certain proposals. Finally, our guest speaker spoke with passion regarding the future of Northern Ireland and its relationship with the Irish Republic and said that he believed the future will see an even more harmonious relationship between the two countries. The President of the Conservative Monday Club, the Viscount Massereene & Ferrard, thanked Sir Jeffrey and again commented on the close ties between the Club members and the DUP. Sir Jeffrey was then thanked by Martin Pritchard who commented that the speaker had spoken with great passion for the unity of Northern Ireland, England, Wales and Scotland and that he was a true patriot. The Loyal Toast was given by Dr Stuart Blackie. To those members of the Conservative Monday Club who were unable to attend the dinner but gave donations, the Club is sincerely grateful. In September, I read an article in The New Statesman entitled: “A World Without Animals”! A shocking title for an article maybe, but one that presents a truly horrific prospect for our world. This powerful article, written by Simon Barnes, considered some of the most deeply concerning statistics, highlighting the plight of some of our planet’s gravely endangered species. The article quotes the Living Planet Index, compiled by the Zoological Society of London and the Worldwide Fund for Nature, warning of a dramatic decline in wild animals by 2020, with 13,000 of the 65,000 species listed by the International Union for Conservation of Nature as being under threat, with 3,000 of these being critically endangered. Possibly the worst of all is the decrease in the numbers of Black Rhinos… 95% in the past 50 years. Primates are also drastically falling in numbers, as a study published in the journal, Science Advances, revealed that 60 % are threatened with extinction, including gorillas and chimpanzees. And the British Isles are by no means immune from the decrease in native species, with the RSPB reporting the Hen Harrier being close to extinction in the UK; the Turtle Dove that has reportedly declined by 93% since the 70s; and the Skylark with a population of 10% of where it was 30 years ago. The author of this article does not pull his punches, stating that our planet is going through a significant change and that we are witnessing “right now” the process of widespread extinction and that humans “seem to have accepted the idea that the loss of wild animals is the sad, but acceptable price of progress and that the loss of animal species is not seen as a serious matter”, asking “when did you last hear a politician talk about the extinction crisis”? Well, Mr Speaker, tonight we are proving that assumption to be wrong, in this House of Commons and across the world, we must speak up about this crisis and do so with clarity, ever more loudly and with increasing frequency. Keynote statistics about marine wildlife are also extremely alarming: the acidity and temperature of the seas are rising and, according to the UN Food and Agriculture Organisation’s State of the World Fisheries and Aquaculture Report 2016, 90% of fish stocks across the world are fully exploited, over exploited or in crisis. With the global human population increasing and the demand for all natural resources sky rocketing, scientists are understandably pessimistic about the future. I say to the Minister, we all need to study the work of the Zoological Society of London’s EDGE of Existence programme, which prioritises species that are both Evolutionary Distinct and Globally Endangered according to the Red List of the International Union for Conservation of Nature. The EDGE programme uses a scientific approach to allocate limited funding most effectively to unique and special animals that could otherwise so easily be forgotten. The time to act is not next year or after the next election or at some point in the future, the time to act, Mr Speaker, is now. So in future, we must act faster when we can do so to protect and save our wildlife and work with international organisations, both governmental and non-governmental, to do everything we possibly can to crush poachers, promote job creation in environmental conservation efforts across the world and, most importantly, strive to rebalance our relationship with nature. The Minister’s department, DEFRA needs greater resources to place more people on the ground, across the world, working to protect animals in peril, and plants too. The Department for International Development should also re-evaluate how it allocates money and consider how it might provide more help for anti-poaching efforts and environmental conservation. The Government should also allocate more time in both the House of Commons and the other place for debating environmental issues, and given the significance of some of the challenges we are discussing this evening, I think using more of our time in this manner would not only be appropriate, but would gain widespread approval from the public. The Government also needs to make greater commitments to international conventions and agreements and push for further- reaching targets, especially as we leave the European Union. The United Kingdom has led the world on these issues in the past and I have no doubt that the Minister will agree with me, when I say that Britain can and must do so again in the future. Additionally, the Government needs to continue to commit to the UN’s Sustainable Development Goals. While these goals do not necessarily focus on the protection of wildlife, it is beyond question that in order to ensure wildlife is protected and sustainable, both in the UK and worldwide, we need to counter those other issues such as poverty, health, education and sustainable cities. On the last of these, it is important that in the UK we ensure that our cities can be a home for wildlife. We can help people and nature by improving air quality, river water quality and expanding the size of, and improving the health of, green spaces in every urban area. In short, we must make sure that our future legislation uses every opportunity to promote conservation. We need to engage ourselves in an enormous effort to guarantee the future of the wild and the many animals and plants in peril, so that our successors can enjoy the knowledge of there being a wild beyond our shores, within these islands and on our very doorstep…. and not finding themselves in A World Without Animals. In short, we as a civilisation have to face up to one of the biggest challenges we will ever encounter: rebalancing how we fit within the natural world. This speech was originally given as the subject of an Adjournment Debate on Wednesday 18th October, 2017 and is reproduced here by kind permission of the author.